This miter, the ceremonial hat worn by a Catholic Bishop, was made in the 16th century by indigenous artisans working with feathers. 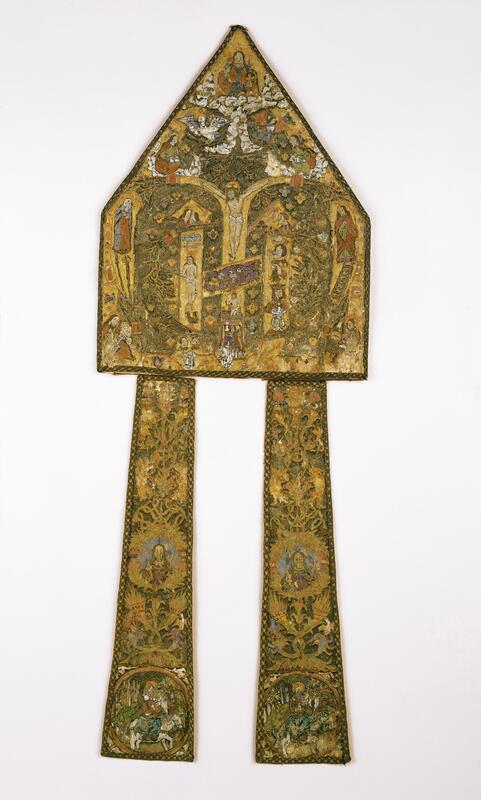 This “feather mosaic” displays a scene of the Mass of St. Gregory. According to Christian tradition, St. Gregory, a 6th century pope, had a vision of Jesus while he said mass, which he took as a sign that Jesus was indeed present in the consecrated host. Renderings of the Mass of Saint Gregory were common in European art and transported to the New World via paintings and woodblock prints. The figure of Gregory at the altar appears directly beneath the crucified Jesus, and he is dwarfed by the cross used for the crucifixion, which sprouts branches, and is set against a background of a field of flowers, connecting it to the Tree of Life. 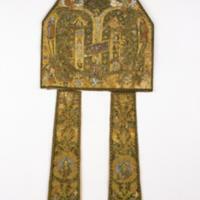 Two infulae, like broad ribbons, hung off the back of the miter. At the bottom of each infula, a roundel contains a scene from Jesus’s infancy, as he and his mother escaped Herod’s wrath by fleeing to Egypt on a mule. It is not known who commissioned this piece, but it was likely a high-ranking Spaniard in New Spain, perhaps a religious man, who called on highly skilled indigenous artists. Objects made out of feathers were prized rarities in Europe and surviving works are rare. This piece, like others with better-known histories, may have been commissioned as a gift to be sent to Europe. Such extraordinary works of native craftsmanship were likely made within a few decades of the conquest, before traditional indigenous workshops and artistic techniques were abandoned. The miter is made of heavy paper, lined with cloth. The miter measures ca. 41 x 32 cm (ca. 16 x 12.5 inches); the infula are long and thin, ca. 44 x 10.5 cm (ca. 17 x 4 inches). Tiny feathers of many different birds have been painstakingly glued to the paper to create the imagery. This technique, called feather working or feather mosaic, was developed, and highly prized, in central America long before the Spanish conquest. Although changes in tribute and trade networks which followed the Spanish conquest ultimately shifted practices for working with feathers, pre-Hispanic networks and knowledge of working feathers persisted well into the 16th century. Late colonial works are also known and one can, in fact, still purchase featherwork objects in Mexico today. Surviving feather mosaics made in the colonial period often have religious imagery or were made for liturgical use. Many of the surviving ones come from church or royal collections. This particular piece was in Munich in the 1960s. It was bought at a Christie’s auction in London in 1980 by the Hispanic Society of America in New York. The fusion of European Christian imagery and indigenous techniques seen in the feather mosaic is a material record of the cultural interchange that began in Spanish America from the moment of Columbus’s landing. As with other Christian works, like atrio crosses, native artisans employed European imagery, but in this case, the feather mosaic of the headdress may have carried indigenous meanings of preciousness and authority—meanings well recognized by feather workers who crafted elegant objects for Aztec patrons before the arrival of Spaniards, and would have passed their skills and knowledge to their heirs. El arte plumaria en México. 1993. Mexico City: Fomento Cultural Banamex. Mundy, Barbara E. 2015. The Death of Aztec Tenochtitlan, the Life of Mexico City. Austin: University of Texas Press. Russo, Alessandra. 2002. “Plumes of Sacrifice: Transformations in Sixteenth-Century Mexican Feather Art.” RES 42 (Autumn): 226-250. Russo, Alessandra, Gerhard Wolf and Diana Fane, eds. 2015. Images Take Flight: Feather Art in Europe and Mexico, 1400-1700. Munich: Himmer.